Anatomical structure is important for medical education and disease diagnosis. In the application of surgical simulation, different anatomical structures can be retrieved to create variety of surgical scenarios for training, while similar structures can also be retrieved to assist disease diagnosis. 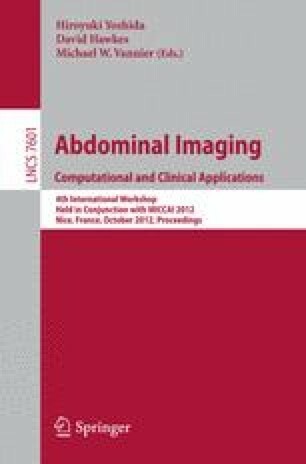 This paper presents an approach to liver-gallbladder anatomical structure retrieval with 3D shape comparison, where the direct shape comparison based on dense shape registration is applied to liver shape due to its shape complexity, and feature based comparison is applied to gallbladder shape with a semantic shape decomposition using the saliency area based on multi-scale curvatures and concavity. After the registration of liver models, the geometric structure of the gallbladder and liver can be combined for joint comparison. With the 3D models constructed from a set of liver-gallbladder CT data, experiments are conducted for joint liver-gallbladder retrieval. Encouraging result shows that it can reveal important topology based on similarity and variance of 3D shapes and has a similar performance compared to that of manual retrieval by human operators.